All month long, KidzWorld will be learning about the Big Idea of Conviction–standing for what’s right, even when others don’t. As a reminder to stand for what’s right, we are offering a “stand” shoe tag project for the family take-out this month. Pick one up at KidzWorld. Then have fun as a family making personalizing your own shoe tags. The instructions are included below. 1. Color. Color and personalize your stand tag with colored pencils. Make sure you color on the rough side. The word “stand” should be backwards to you while you are coloring. DO NOT use water color markers or crayons. 2. Cut-out. 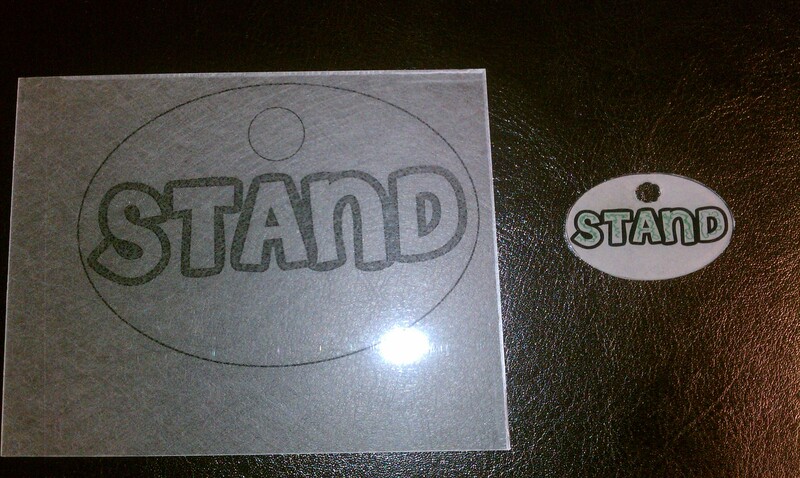 Cut out the “Stand” tag on the outline. 3. Punch Holes. Punch out the small circle to form a hole to fit your shoe lace or a necklace. NOTE: You will need to punch out the entire small circle as the hole will shrink when heated. You will need to make more than one punch if you are using a standard hole punch. 5. Show it off! Lace your “Stand” tag on your shoe lace or wear it as a necklace or backpack tag. Use it as a reminder to stand for what’s right even when others don’t.